John Kerry's face every moment for the past month. A State Dept official pushed back hard on the idea of a proposal that #Syria hand over its CW to avoid a strike. #SecKerry and #Russia's Lavrov spoke by phone about 2 hours into the flight. #Lavrov said he's heard Kerry's remarks on CW in the presser. #SecKerry told #Lavrov that they were totally rhetorical. Lavrov said he'd like to engage on the idea. Kerry expressed strong skepticism. The Obama administration’s resistance to his own half-assed proposal is understandable. Assad is not the most trustworthy fellow. How would this work? How could Assad’s full cooperation be guaranteed? The proposal would also fail to achieve one of the main goals Obama hoped to accomplish by bombing Syria: upholding international norms against using chemical weapons by exacting a penalty for such actions. The message of the Kerry/Russia deal would be that any dictator out there who massacres his own citizens with chemical weapons would, at worst, be asked to voluntarily give up his weapons. It’s hard to see that precedent serving as much of a deterrent to Iran or other rogue states. At the same time, getting Assad to give up his chemical weapons would still go a long way toward accomplishing another goal of Obama’s — degrading Assad’s ability to kill civilians, and attack America’s allies, with chemical weapons. Resistance from Congress is making military strikes increasingly unlikely anyway; this would surely be far preferable to doing nothing at all. It’s not clear whether this proposal has any legs yet, but it’s just possible that John Kerry managed to bumble and stumble his way into some kind of face-saving solution to the Syria dilemma. Update, 6:09 p.m.: In interviews with CNN and NBC News today, President Obama called the nascent proposal a "potentially positive development." 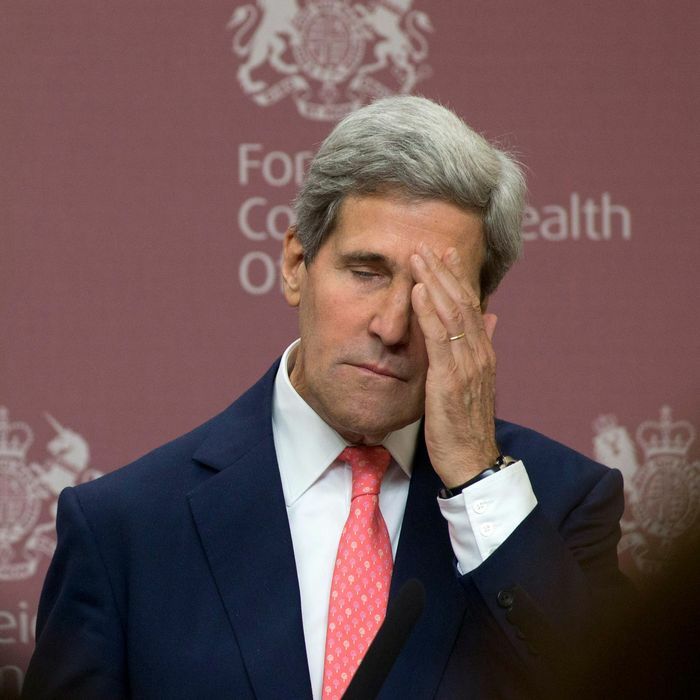 Kerry Accidentally Stumbles Into Syria Solution?